Atlas Copco has launched three new electric plug-and-light LED light towers to the U.S. market at World of Concrete 2018 in Las Vegas. The HiLight P2+, V2+ and V3+ light towers can be powered directly from an auxiliary power source, a portable generator or the grid. The three energy-efficient additions offer easy portability, safe transportation and durability. The HiLight V2+ offers a 320-watt LED light source, covering 21,528 sq ft. The HiLight V3+ is equipped with four 160-watt LED bulbs with specially designed directional glass optics capable of illuminating an area of up to 32,292 sq ft. Both the V2+ and V3+ have manually operated vertical masts that extend up to 18 ft. The towers are designed to withstand wind speeds up to 51 mph. Ideal for almost any application, the HiLight P2+ features the same special lighting optic as the HiLight V2+. The floodlight provides 360-degree coverage across a 21,528-sq-ft illumination area — a much greater area compared to traditional balloon style light towers. The light source is housed within a weatherproof cylindrical polyethylene housing with built-in cooling for no burnout and a longer operating lifetime. The housing does not require air pressure or complicated mechanisms to operate. The entire HiLight P2+ assembly weighs just 99 lbs, yet is robust and designed to withstand wind speeds up to 32 mph. The manually elevated vertical mast provides a maximum operating height of 11 ft. The LED lamps on all three new models have a life expectancy of more than 30,000 hours. LED HiLight tower lamps have an aluminum casting which provides heavy-duty protection, even during transportation. “Our new HiLight towers are designed to help workers experience a brighter, safer environment that will enhance their productivity,” said Angel Nieto, Atlas Copco product manager, Power & Light. Atlas Copco is focused on three core product categories: air, power and flow. 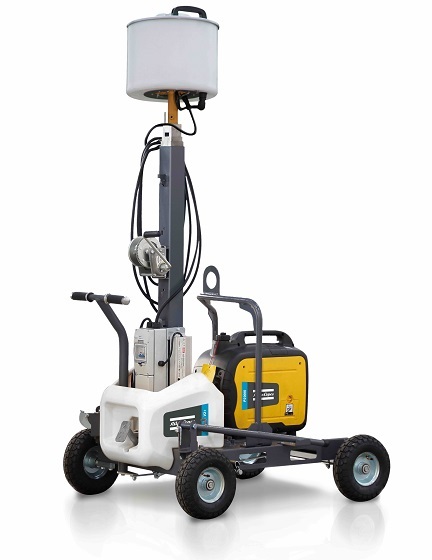 The new light towers are an important piece of Atlas Copco’s power portfolio and light-tower offering. They join the V5+, V4, V4W and E3+ in the HiLight lineup. Learn more about light towers here.